MISSISSAUGA, ON, Nov. 26, 2018 /CNW/ - Maple Leaf Foods (TSX: MFI) today announced plans to build a $660 million value-added fresh poultry facility in London, Ontario. Funding for the project includes a capital investment of approximately $605.5 million from Maple Leaf Foods, an investment of $34.5 million from the Government of Ontario and a $20 million investment from the Government of Canada under the Strategic Innovation Fund. In addition, the Company is receiving a $8 million loan from the AgriInnovate Fund. 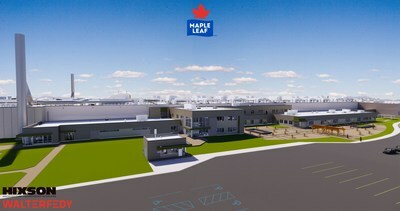 As part of the federal funding agreement, Maple Leaf will invest a further $5 million over the next five years on projects that accelerate adoption of advanced manufacturing and production technologies and support the Company's goal to reduce its environmental footprint by 50% by 2025. "This world-class facility will enable Maple Leaf to meet the steadily growing consumer demand for premium, value-added poultry products, and strengthen Canada's food system," said Michael H. McCain, President and CEO. "It will incorporate leading edge food safety, environmental and animal care technologies that advance our vision to be the global leader in sustainable protein. This is a historic investment in the Canadian poultry sector, providing significant stakeholder and economic benefits and ensuring that Canada has sufficient domestic processing capacity to meet forecasted poultry production and demand." This strategic investment will deliver a solid return on capital and create significant shareholder value. The project is expected to deliver annualized benefits of $105 million to the Company's Adjusted EBITDA on a run-rate basis within 12 months of completing start-up, and by the end of 2023. Based on current sales, adjusted for recent acquisitions, we estimate this will contribute over 270 basis points to the current Adjusted EBITDA margin. The project is expected to be accretive to earnings beginning in 2022 and contribute to the Company achieving its Adjusted EBITDA margin target of 14% - 16%. "Once constructed, this new poultry facility will be a significant contributor to our overall Adjusted EBITDA margin target and will provide tremendous long-term strategic value in an important growing component of our business," added Mr. McCain. "Our government is excited to invest in Maple Leaf Foods' project to help bring new innovations to Canada's food processing industry, keep Canada competitive in the global market and create new middle class jobs in Ontario. This new state-of-the-art facility demonstrates how innovation is creating jobs and helping the environment with more sustainable poultry processing," said The Honourable Navdeep Bains, Minister of Innovation, Science and Economic Development. "Canada's agri-food industry is a key driver of innovation and well-paying jobs across the country. Our government is proud to invest in Maple Leaf Foods, helping to position Canada as a globally competitive player in the food processing sector and to increase the competitiveness and sustainability of our agricultural sector," said The Honourable Lawrence MacAulay, Minister of Agriculture and Agri-Food. "This is the largest investment in the history of Ontario's agriculture sector, it demonstrates industry confidence in our growing economy, and it's another example of how we're making Ontario open for business. It's great to see a company like Maple Leaf investing here in London. This innovative new plant will modernize processing, and help make Ontario's chicken farmers more competitive," said The Honourable Doug Ford, Premier of Ontario. Chicken is the most consumed and fastest growing meat protein in Canada, offering versatility, nutrition and a lower environmental footprint. 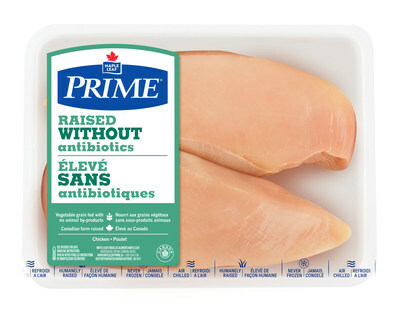 There is particularly high demand for raised without antibiotics and halal chicken products, where Maple Leaf has the leading national brands. This scale facility will address constraints in Maple Leaf's current Ontario network, enhance operating efficiencies, and expand its value-added product mix and capacity to meet growing consumer demand. 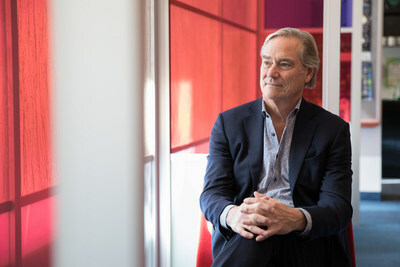 The decision to proceed followed an extensive review by the Company's management and Board of Directors, led by a special working group that conducted a detailed analysis of all the strategic, capital and operational elements, risks and returns, and alternatives to optimize return on capital. As an indication of the rigor of this process, the new facility is approximately 90% design-engineered, providing a high degree of certainty about project costs and operational outcomes. Maple Leaf expects to incur one-time costs of approximately $140 million, including approximately $45 million in net cash restructuring and other related costs. The Company plans to finance this investment through a combination of cash flow from operations and debt. "I would like to welcome Maple Leaf Foods to London," said His Worship Mayor Matt Brown. "London's commitment to world-class infrastructure and a robust industrial land strategy put London in a competitive position to attract an investment of this magnitude." Production from the Company's three sub-scale and aging plants in Ontario will eventually be consolidated into the new facility. The Company's plant in St. Marys is expected to close by late 2021, while its plants in Toronto and Brampton are expected to close by mid-late 2022. Each of these plants is 50 to 60 years old, with location, footprint and infrastructure constraints that limit opportunities to expand and modernize to meet growing market demand. Maple Leaf will work with local communities and government to find alternate uses for the facilities when they eventually close. "We deeply regret the impact that these eventual closures will have on our people and communities," said Mr. McCain. "While these closures are several years away we are informing our people well in advance, allowing us to openly communicate and support them through this long-term transition. We will provide them with job opportunities at the new facility and other Maple Leaf plants, and services to help them eventually secure new employment." An investor webcast and conference call will be held at 5:30 pm EDT on November 26, 2018. To participate in the call, please dial 1-800-806-5484 or (416) 340-2217. For those unable to participate, playback will be made available in an hour at 1-800-408-3053. An investor presentation will be available at www.mapleleaffoods.com and can be found under the Investor Relations Section under the presentations & webcasts tab. Such statements include, but are not limited to, statements with respect to the new poultry plant and the Company's strategies, plans, actions and expectations including, among other things, expectations about technical capabilities of the new poultry plant, expected shareholder value creation, future earnings, Adjusted EBITDA margins, project costs, net cash restructuring and other costs, jobs generated, timing of plant closures, construction timelines and other expected benefits of the new poultry plant. Words such as "expect," "anticipate," "intend," "attempt," "may," "will," "plan," "believe," "seek," "estimate," and variations of such words and similar expressions are intended to identify such forward-looking information. These statements are not guarantees of future performance and involve assumptions, risks and uncertainties that are difficult to predict. These statements are based on and were developed using a number of factors and assumptions including, but not limited to: stability in the Canadian, U.S., U.K. and Japanese economies; stability in prevailing exchange rates among the Canadian dollar, the U.S. dollar, the British pound and the Japanese yen; stability in the availability and pricing of raw materials, energy and supplies; the ability to implement price increases successfully; stability in the competitive environment; no future product recalls; the continued ability of the Company to access cost effective capital when needed; and no unexpected or unforeseen events occurring that would materially alter the Company's current plans. All of these assumptions have been derived from information currently available to the Company including information obtained by the Company from third-party sources. Although these assumptions were considered reasonable by the Company at the time of preparation they may prove to be incorrect in whole or in part. In addition, actual results may differ materially from those expressed, implied or forecasted in such forward-looking statements, which reflect the Company's expectations only as of the date hereof. Readers are cautioned not to place undue reliance on forward-looking statements, as such statements are not guarantees of future performance. Factors that could cause actual results or outcomes to differ materially from the results expressed, implied or forecasted by the forward-looking statements include risks associated with implementing and executing complex projects and plans including the availability and price of labour and construction materials and the risk of cost over runs; risks posed by food contamination, pandemics and product recalls; risks associated with the price of commodities and the inability of the Company to control commodity prices; risks associated with exchange rate fluctuations; risks associated with changing consumer tastes, preferences and buying patterns; and risks posed by competition; the risks associated with the supply management system for poultry in Canada and the availability of live chickens for processing; and the risks of attracting and maintaining sufficient labour for the plant . Additional factors that could cause actual results or outcomes to differ materially from the results expressed, implied or forecasted by the forward-looking statements are discussed more fully in the Company's filings made with the Canadian securities regulators including in the section entitled "Risk Factors" in the Company's Management's Discussion and Analysis for the year ended December 31, 2017. All of such filings are available on SEDAR at www.sedar.com. Some of the forward-looking statements may be considered to be financial outlooks for purposes of applicable securities legislation including, but not limited to, statements concerning future Adjusted EBITDA margins, project costs and net cash restructuring and other costs. These financial outlooks are presented in order to provide measurable targets that the Company aims to achieve and for which the Company can use to benchmark its results. These financial outlooks may not be appropriate for other purposes and readers should not assume they will be achieved. 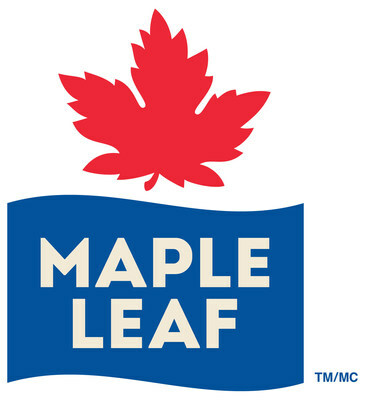 Maple Leaf Foods Inc. is a leading consumer protein company, making high quality, innovative products under national brands including Maple Leaf®, Maple Leaf Prime®, Maple Leaf Natural Selections®, Schneiders®, Schneiders® Country Naturals®, Mina®, SWIFT®, LightlifeTM and Field Roast Grain Meat Co.™. 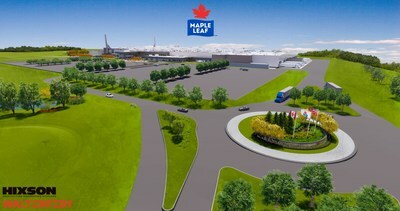 Maple Leaf employs approximately 11,500 people and does business in Canada, the U.S. and Asia. The Company is headquartered in Mississauga, Ontario and its shares trade on the Toronto Stock Exchange under the ticker symbol MFI.